1 Do bloggers make money? 2 How do bloggers make money? 3 How much do bloggers make? Bloggers have been making good money online for over a decade; and not just making a living through blogging, but actually becoming wealthy. Experienced bloggers are making more money blogging than ever before thanks to the advances in internet marketing technology and all the various advertising platforms available to them. Blogging is big business, much bigger than you think. As you read on, you’ll get a glimpse of just how much money bloggers are really making. The majority of bloggers are making money through monetizing their blogs by using affiliate marketing (projected payouts to affiliates are $6.8 billion by 2020, then $8.2 billion by 2022 – source: Statista), placing adverts utilizing different ad networks (mostly Google AdSense), charging for guest blog posts, or a combination of these. Bloggers are branching out into generating earnings from YouTube, Instagram, and other social media platforms as well. Those who own their own blog and social media accounts are able to reach even more people to grow their audience and subscriber base. Bloggers are now even creating and selling their own digital products (courses, eBooks, memberships, etc.) seamlessly on their blogs as well (more on this later). Basically, blogging should be treated like starting a small business and the best part is you don’t have to spend any money on advertising. Most bloggers rely on organic search traffic rather than paid advertising. Some other ways that bloggers use online marketing to readers is through email marketing, social media marketing, content marketing, display advertising, and PPC (pay-per-click), ans SEO (search engine optimization). People used to start a blog for fun and it was done mostly for personal uses, like cataloging your vacations and family photos. Now it’s a totally different story; people pay you to put ads, recommend products/services, and share content on your blog. According to a report by Glassdoor, the average blogger makes anywhere from $19,000 to $79,000 a year. A survey by blogging.com found that 17% of bloggers can sustain their lifestyles and family through blogging. 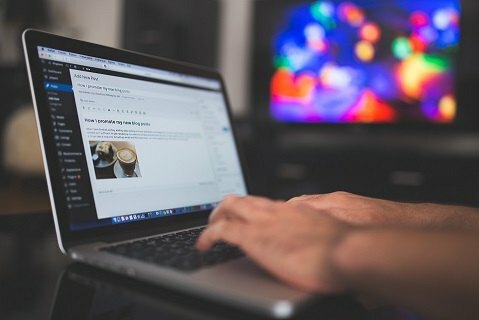 Another survey by problogger.com showed that 9% of bloggers make between $1,000 and $10,000 a month. That is from only one blog though. Most go on to create many more blogs, with the “rinse and repeat” process to increase their incomes by more than 10 times in some cases. To get some insight into how much a majority of bloggers are making, here are some stats from another poll by DigitalNovas. As you can see in this infographic, 46% of participating bloggers make less than $500 a month. And another 29% have not made any money yet. It does not look encouraging, as this comprises 75% bloggers that responded. It shows 15% of bloggers making between $500-$1,500/mo., and another 9% earning between $1,500-$10,000/mo. This shows a big disparity between earners and non-earners. Also, there’s a large jump in the earnings scale and it’s not clear where the sources were taken from. Only 1% of bloggers polled were making more that $10,000 per month. Now obviously these are not typical results bloggers are seeing and I’ll discuss what they’re doing differently in order to be in the top 1%, but the below list of popular blogs is just to show you what is possible. Remember these bloggers started out with just a simple free blog. Again, they’re using a combination of the following strategies; affiliate marketing, ad networks, hosting guest blog posts, and now their own digital product sales. As shown above, Sarah Titus from sarahtitus.com made $3 million last year. Pat Flynn from smartpassiveincome.com, earned a cool $2 million in 2018. Michelle, owner of makingsensewithcents.com made $1.5 million. Michael Arrington- Founder TechCrunch.Com– Earns $500,000- $800,000 per month from blogging. The main topic that TechCrunch.Com covers is technology. Peter Cashmore- Founder Mashable.Com – Earns $560,000- $600,000 per month from blogging. Topics covered by Mashable are technology, social media, business, and entertainment. Mario Lavanderia- Founder PerezHilton.Com– Earns $200,000- $400,000 per month from his blog. Topics covered by Perez Hilton are fashion, entertainment, celebrities, and gossip. Vitally Friedman is the founder of SmashingMagazine.Com. He earns $150,000-$190,000 per month from his blog. Smashing Magazine is a blog for web designers. Timothy Sykes- Timothy’s Blog, TimothySykes.Com majorly focuses on finance, investment, stocks and life improvement. According to Forrester, the U.S. digital marketing spend will be an absolutely massive $120 billion by 2021, which is 46% of all advertising budgets. Worldwide, the number is said to be a whopping $192 billion. As you can see, it’s a great time to get started blogging. The future is very bright. Once you’re getting enough visitors, another common way to get paid as a blogger is to register with ad networks such as Google AdSense or Media.net (from Yahoo/Bing) and have advertisements show up within the content on your blog. On average if you are getting 150 daily visits to your site from search engine traffic, you can make roughly $100 over 3 months. However, you could have made at least 10 times that amount in the same time frame with affiliate marketing. Adding ads to your blog only makes sense and really starts to pay when you start getting around 10,000-30,000 visitors per month. At that point, you can expect to earn around $500-600 a month just from having ads on your blog. High-traffic blogs can earn 5 and even 6-figures per month just by publishing a lot of information online. The more articles you have, the more traffic you’ll get, which equals ad views. Some blogs only use this method, but they have hundreds of thousands of monthly views. Making this a reality requires much more time, investment, and hard work. The vast majority of bloggers are doing affiliate marketing and getting paid by an affiliate network company or by the vendors themselves. By joining various affiliate programs (there are hundreds of thousands to choose from depending on your niche), you’re able to promote whichever products or services that are related to your blog. This includes physical products, by joining large marketplace affiliate programs such as Amazon Associates, or digital products (memberships, subscription-based services, online courses, eBooks, etc.) A good example of a digital product affiliate marketing program is Clickbank. A majority of affiliate programs payout their affiliates using PayPal, Payoneer, wire transfer, check, or cryptocurrency. Some other popular affiliate programs are Share A Sale, ClickBank, Rakuten, Awin, JVZoo and CJ Affiliate. From their sites type your topic in the search bar to find relative offers to add to your blog. One of the best and most known is the Amazon Associates Program. As a member you can promote anything from their catalog relating to your blog. This next method of monetization falls under content marketing and is also called sponsored post. This allows you to make an income by placing articles written by others (w/ their link) on your blog for a fixed monthly fee. These blog posts that you’ll publish will be relevant to your blog and original, written just for your site. There are excellent services that help you accomplish this, such as Adsy. Realistically, you can start off earning $50-$100 per article that you publish and grow to several hundred dollars a post, depending on your niche and audience (traffic). If you want to increase your blogs reach online and ranking in the search engines, this is possible by getting quality backlinks to your site. In this case, you’d be paying for a sponsored post on somebody else’s influential blog by creating an article with a link to your blog to be submitted and published. Rates vary depending on the popularity of the blog. In order to make money and get paid from your blog site, first you’ll need to follow what your interests and hobbies are. The best part is that you’re going to be blogging on subjects that you’re already into; your passions, knowledge you have on a certain subject or basically anything that you can share something about. Sharing your thoughts, providing helpful info to people with similar interests is the name of the game. Basically you are helping people by providing the information they’re looking for. You’d need to pick a niche that will also have relating products or services to tie in, that you can recommend or promote. Basically matching your interest with available affiliate offers. With a simple Google search such as ‘your interest + affiliate program’, you’ll find programs to enroll in. They will give you a special link to place on your blog and when clicked on, the sales will be tracked back to you. The commissions from these sales will be paid out usually through PayPal. You can then transfer the cash to your bank account. So, most importantly you should find a niche that you will enjoy. You should be somewhat informed on your niche of choice and be willing to share content to your audience on a fairly regular basis. Choose a subject that you can continually write blog posts about. The best place online to create a free blog, while going through courses on how to make money from blogging, is the WA community. They offer everything in one all-encompassing platform. Included is top-of-the line training, hosting and 2 free domain names to get started blogging. 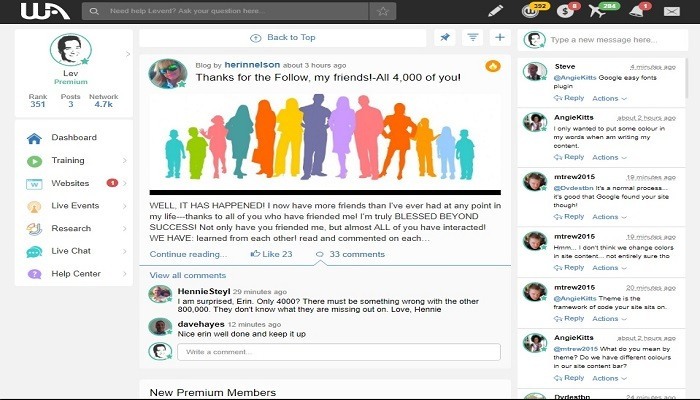 You’ll also have access to one of the most active, helpful communities there is, all for free. I’m not going to go into all the steps required to get started with a blog and start earning commissions because WA teaches all of this while going into a great amount of deal (see for yourself below). The 2 free blogs they give you are powered by WordPress and are hosted on their SiteRubix platform. SiteRubix is one of the most secure and technologically advanced website hosting services available for blogging. Using high security encrypted (SSL) and super-fast page loading times. Your blog will rank much more easily, because Google uses site speed as a ranking factor now. It takes on average, between 3-6 months to make your first sale from the time you publish you first blog post. The reason it takes this long is because after you write and publish your content, it takes time for the search engines to crawl and rank your pages in the search results. Because your blog is new, it will take time for Google, Yahoo, and Bing to trust your site. You must continue to publish new blog posts at least a couple times a week in the beginning. When you reach up to 30+ blog posts published on your site you should have a decent amount of traffic coming to your blog (if you have your keyword research done correctly). As you continue to do this the search engines will crawl your site more frequently and the more blog posts that you have consistently published, the more they’ll rank your posts. This is how you get consistent free traffic to your blog. As more of your content starts to rank, so will new posts and it will be a snowball effect. Depending on your work ethic and how much time you put in to blogging, it may take some people even up to a year to see positive results, you. However, if you have the proper training and guidance from a mentor or a community of helpful people, you can cut this time in half. Your blog will need to have proper on-page SEO. This helps Google and Bing crawl your website and list your site in the search results when someone is searching for a related topic that can be found on your site. Most WordPress themes have this built into your site anyway. There are plugins that help with this as well. I’ll get into this later. You may need to build a presence on a couple of the social media networks such as YouTube, Facebook, Twitter, and Pinterest. You should always share your articles and blog posts on these social media platforms. To gain popularity for your blog, consider having a YouTube channel and create videos related to your blog topic, then post them on YouTube. You can also embed the same YouTube video within your relevant blog post on your website. Remember: guest blog posting and reaching out to influencers in your niche is a great way to get more exposure. Search Engine Optimization (SEO) will help you get free organic traffic for life. It will also increase the popularity of your blog. Have high-quality,original content on your blog that has the right keywords and post regularly (at least a few times a week). Also, post relevant videos on YouTube. You can even embed yours along with others’ popular videos on your blog. Share your articles on social media. Affiliate marketing will unlock the door to blogging income. Affiliate marketing is a marketing arrangement where an online retailer pays a commission to a blogger for generating sales or traffic for the retailer. Joining an affiliate program will connect you to merchants who are looking for sales and traffic. 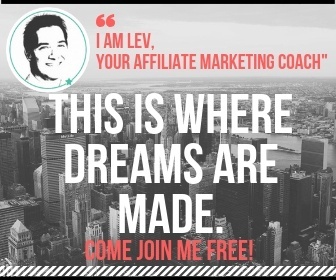 I recommend learning from the best, join WA Online Business Community & Training for free here. This where I got my start in learning how to blog for a living. With WA, you’ll get 2 income generating blogs with free hosting, hundreds of WordPress templates to choose from. Top-notch world class training, free step-by-step videos and courses. Plus the community is full of helpful members available to help with any questions you may have; there’s even a 24/7 chat. Be on your way to earning a full-time blogging income in a matter of months. Now that you know how easy it is to start blogging and make money with a blog, hopefully it’s enough to get you to take some action today.